Includes a free preview of future issues in the collection The American Spirit . For more information, please refer to the Satisfaction Guarantee tab below. If you do not wish to preview future issues in the collection, you may purchase the single item using the 'Individual Item Only' tab at right. In the aftermath of the worst terrorist attack ever experienced on American soil, the nation mourned for those whose lives had been lost so tragically. The days following the attack saw the American people banding together to clean up and rebuild the buildings and lives that had been destroyed. Now, 12 years later, Osama Bin Laden has been brought to justice and the United States is more dedicated than ever to the cause of Freedom and Democracy. We will never forget the events of September 11th, 2001, and nothing will ever defeat the American Spirit. Our 9/11 Commemorative Coin pays tribute to the nearly 3000 Americans whose lives ended so senselessly on that sorrowful Tuesday in September. Issued in 2013, this gleaming .585 gold coin features a detailed engraving of the Statue of Liberty in her full glory on the obverse, along with a depiction of the twin towers of the World TradeCenter rising above the New York landscape. The coin also includes an inspirational quote from Rudolph Giuliani, the New York City mayor who guided the city's eight million citizens through the aftermath of the disaster. The reverse of the coin is encircled with the legend "The American Spirit - Remembering 9/11" and includes an engraving of the bald eagle, the enduring symbol of American liberty,with the towers serving as a fitting backdrop. We've expertly minted the 9/11 Commemorative Coin to the highest proof standard, ensuring you'll receive an item of the highest quality. We'velimited this one-of-a-kind collection to only 9,999 coins, so act quickly while they're still available. Each coin comes with a protective case to allow you to preserve its beauty for future generations, along with a Certificate of Authenticity. 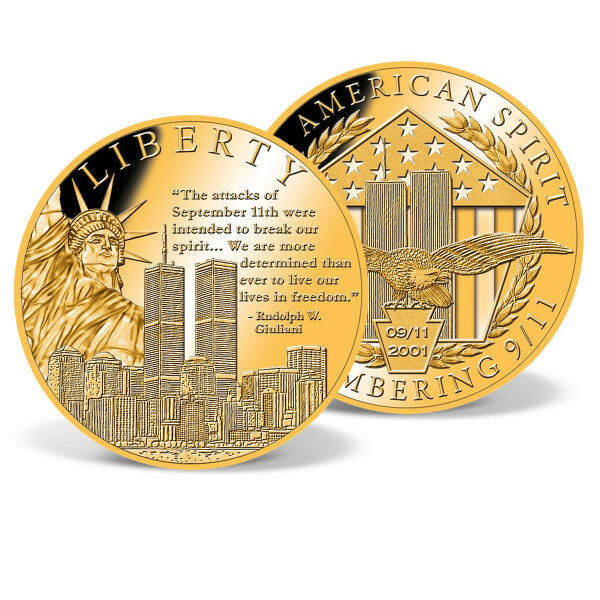 The 9/11 coin is available for immediate online order  and at a significantly discounted price. Don't wait to make this remarkable piece a part of your collection! Add the item to your shopping cart and complete our fast, secure ordering process.